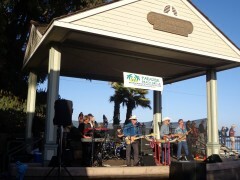 The Art and Cultural Commission bring Wednesday Night Twilight Concerts to Capitola Village on the Esplanade Stage. Families and friends are encouraged to come down and enjoy an array of musical styles from jazz, western, latin, swing, orchestra to rock and roll. The bands will perform from 6:00 to 8:00 p.m.
Bring a picnic dinner and chairs to sit on either in the park or on the beach while enjoying the music filled sunset. A blanket and warm jackets are always a good idea as the summer weather can bring the fog. Check back for Concert Schedules.